Have you ever seen flowing water? Have you ever seen still water? If your mind is peaceful, it’s kind of like still, flowing water. 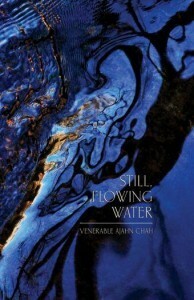 Have you ever seen still, flowing water? [Laughs] There! You’ve only seen still water and flowing water. You’ve never seen still, flowing water. Right there, right where your thinking can’t take you: where the mind is still but can develop discernment. When you look at your mind, it’ll be kind of like flowing water, and yet it’s still. It looks like it’s still, it looks like it’s flowing, so it’s called still, flowing water. That’s what it’s like. That’s where discernment can arise.